Shea Eden is a trainer on the rise in the Victorian racing industry. 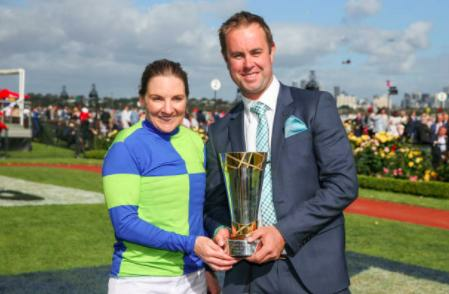 With a proven record of success, a growing owner base, and a strong team of young horses, Shea is fast becoming one of the most respected young trainers in the State, if not Australia. Originally a successful builder, Shea decided to follow his passion for horses and start a career as a horse trainer in 2008. Taking a tradesman's approach, he did an apprenticeship of sorts as a trainer on the strong Victorian picnic circuit and was awarded top trainer honours at major venues Balnarring and Woolamai; his talent with horses was obvious. A professional licence soon followed as did the winners, with Shea gaining a reputation as a young trainer with patience, careful planning, and a skill for placing his horses to the best of their talents. Amongst Shea's success stories are dual Group 3 and Listed winner Ocean Embers, a horse Shea bought for just $23,000 that now has over $450,000 in the bank. Three-year-old Apollo's Choice was another great bargain buy, selected for $40,000 before winning his first two starts and then a placing at Group 2 level - he was sold to Hong Kong for a huge sic-figure sum. $500 discard Rambert became a stable favourite when winning two city races, over $128,000 in stakes, and landing a few well-planned betting plunges in the process. Shea trains from a unique two-property stable with his racing stable on course at the state of the art Cranbourne Training Centre and a beach side property at Corinella, 45 minutes south on the shores of Western Port Bay. With an exceptional team of experienced support staff behind him and a talented crop of young horses, Shea Eden is a forward thinking horseman with goals to grow and achieve elite success. Get in touch with Shea to discuss how he can help your horse.